Do you enjoy driving your 2019 Range Rover Velar? How could you not? The 2019 Range Rover Velar is designed for the ultimate driving experience. It is a beautiful, powerful, reliable, and comfortable vehicle. But there is something that not even Land Rover can failproof – your tires and wheels. Imagine driving through the countryside or rushing to an important meeting and getting a flat tire. For whatever reason, you might find yourself in a situation where waiting for the service to arrive is not an option. In these situations, you will want to change the wheel on your own. Here is another useful guide in our series – How to change a wheel on the 2019 Range Rover Velar. To change the wheel, you will have to raise your vehicle. There are several things that could go wrong here and result in an injury. This is why you have to take certain precautions. The first and the most important one is – if you don’t feel capable or confident enough to perform the procedure on your own, it’s better to call for assistance. Your and your passengers’ safety is not worth the experiment. Make sure that all the passengers are out of the vehicle. This includes your pets as well. Everyone should be at a safe distance from the vehicle and not standing on the road. If you have wheel chocks in your car’s tool kit, make sure to take them out and chock the wheels on both sides. Chocks should be on the downhill side of your vehicle, on the two opposite wheels. Before you start changing the wheel, you have to prepare your vehicle. Make sure to park in the safest spot available – away from the road and traffic. Choose a firm and level ground. You should also switch on the hazard warning lights, even if you are not on the road itself. This will notify other drivers of your presence. If you carry a warning triangle, take it out and place it at some distance behind your vehicle. Make sure that it is facing oncoming traffic. To make sure that your vehicle doors are locked during the wheel change and that you avoid activating the alarm, you will have to turn the tilt sensor temporarily off. Access the Vehicle settings menu and disable it for one alarm cycle only. Finally, before you proceed to change the tire, make sure that your front wheels are in the straight-ahead position. Enter the car and steer the wheel to engage the steering lock. You want to get the spare wheel out before you raise your vehicle with the jack. Make sure you are standing firmly on the ground when lifting the spare wheel. It is heavy and improper handling can cause an injury. Use the securing bolt to secure the spare wheel, don't forget to use it on the removed wheel afterward. Your spare wheel is located in the loadspace under the panel. To access it, you will have to lift the loadspace floor panel. Make sure to secure the panel when you put it on the ground – place it in the upright position. 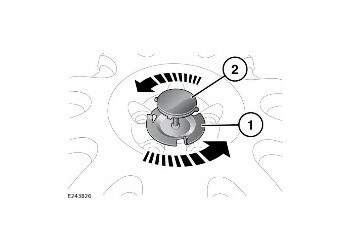 Access the center clamp plate on the spare wheel and rotate it counter-clockwise to release. Now you will need to access the top plate of the center bolt and rotate it counter-clockwise to completely remove it. To safely store the removed wheel, repeat the procedure in the reverse order. Use the locking wheel nuts to loosen the wheel nuts on the wheel you want to replace. The best way to do so and not over-loosen them is to turn each wheel only half a turn counter-clockwise. Once you loosen all the wheels, you will have to locate the jacking point on the side of the vehicle you want to raise. This is very important, because mounting a jack on any other position may damage your vehicle. Place the jack directly under the jacking point, unfold the handle on the jack and fit the wheel nut brace to the end of the cranking handle. To raise the jack, you will have to rotate the handle clockwise. If you’ve placed the jack correctly, the jack pin will fit right into the jacking point. 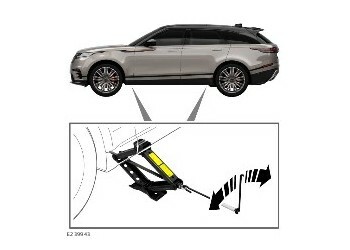 Continue rotating the handle to raise your vehicle. Stop when the wheel is clear of the ground. You can now remove the wheel nuts completely. Make sure to store them carefully so that they don't roll away. Remove the wheel from your car and place it on the ground with its face up. Take the spare wheel and fit it to the hub. Take the wheel nuts and refit them by lightly tightening them. While doing so, make sure that the spare wheel is evenly making contact with the hub. After making sure that the area under the vehicle is clear, rotate the handle counter-clockwise to lower the vehicle. Do this as smoothly and slowly as you can. 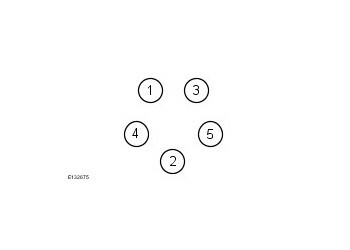 After removing the jack, make sure to fully tighten the wheel nuts in the order shown in the picture below. Make sure to pack your tools and to store the removed wheel properly in your loading space. If you follow this procedure and take all the listed precautions, you will be able to safely replace a wheel on the 2019 Range Rove Velar. If you had to replace the wheel due to a puncture, make sure get it fixed as soon as possible and return it to its original position.